It was quite a cold night but we slept well on our airbed with a duvet and Grannies crocheted blanket keeping up warm. In the morning I made the mistake of trying to walk around inside the tent while bending over and suddenly felt a tweak – I had put my back out again. We packed up and continued to drive down the west coast but my back was feeling painful. I was cross with myself for doing something so silly. We stopped at Whataroa so I could get out and stretch my back. There was a very nice museum of Maori artefacts that we wandered around. We continued on our drive heading for the Franz Josef Glacier. 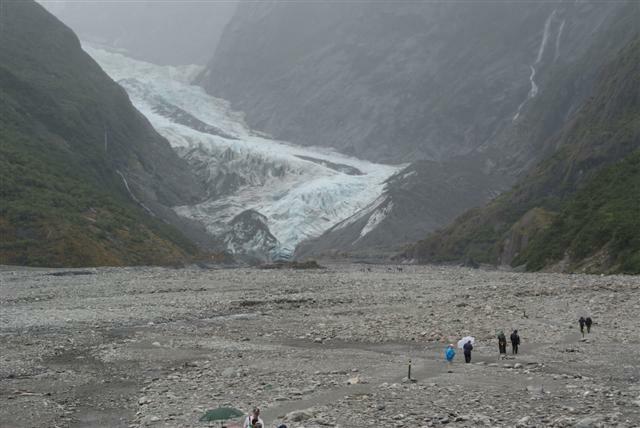 Franz Josef and Fox Glaciers, 15 miles apart, are the only glaciers that descend as low as 300m above sea level any where in the world. 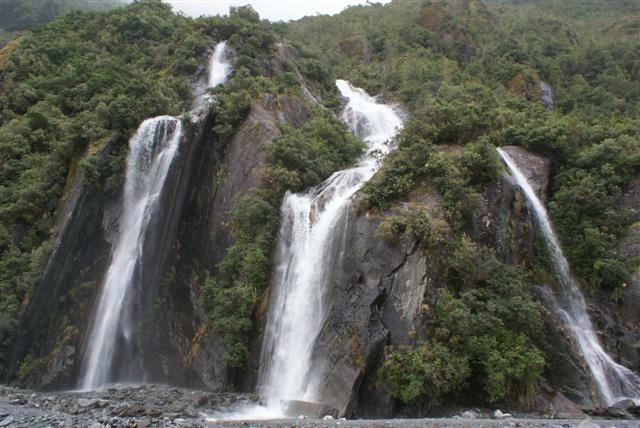 The Franz Joseph descends from the top of the Southern Alps and cuts through dramatic glacial valleys to flow into temperate rain forest and out towards the sea. 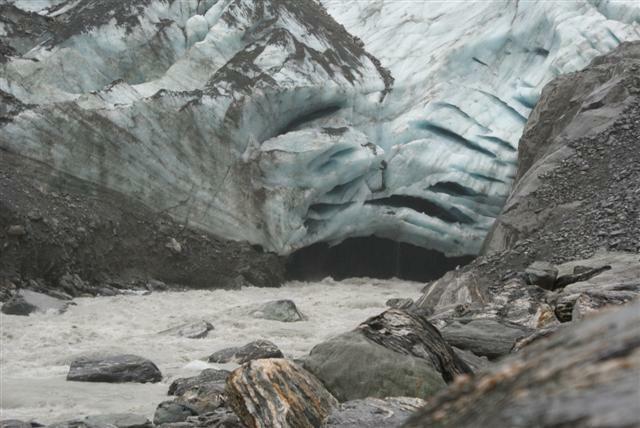 Unfortunately when we got there it started raining but we still walked across the glacial moraine to come face to face with billions of cubic metres of solid blue ice. The rain created the most stunning water falls which enhanced our walk in the rain. We drove back into the town and spent several hours in the Glacial hot pools which varied from 36C to 40C, did my back a power of good. With the combination of the rain and my bad back we decided to book into a back-packers hostel for the night. Very nice and comfortable. Posted on February 8, 2011, in Port posts. Bookmark the permalink. Leave a comment.